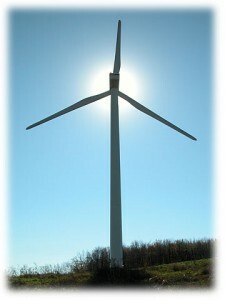 Visiting family in rural Indiana this weekend, I was taken for a drive to see the new wind farm a few miles away. Eighty-seven towering wind turbines standing in the middle of corn fields, all facing the same direction as if they were standing at attention. I looked at the size of these structures and knew they represented substantial investment. My mind started looking for figures to calculate: How much does it cost to build one of these things? How much electricity do they generate? What is the payback period (as in, if it costs a dollar to build one, how long will it take for it to generate a dollar’s worth of electricity to pay for itself?) What is the relative power production of wind turbines compared to traditional power plants? Forgive my cynicism, but all of these questions led to one bigger, more important question: Who’s making big money on this, and who’s getting the shaft? Once you understand a principle, it is relatively easy to find its application in any number of examples. The principle here is that government planners pick and choose winners in alternative energy sources, awarding them handsomely with subsidies that make economically inviable projects profitable for the few, costly to the many. Profits will be privatized, losses will be socialized. I started doing some basic research, and quickly found my cynicism to be justified. There is a substantial lobby in Washington representing the interests of wind farm builders. This fact alone hints that someone is probably making a lot of money at your expense, and if you’re thinking so, you’d be right. Where traditional power generating facilities may write down (depreciate) the value of their capital investment over 20 years, wind facilities enjoy a 5-year double declining balance accelerated depreciation. They then receive a production tax credit of $0.019 for each Kilowatt hour of electricity produced. A wind farm generating 300 MW of electricity a year would earn a tax credit, a dollar-for-dollar reduction of the amount owed in federal taxes of approximately $15 million. For this reason, smaller companies building wind farms typically sell them to very large corporations, who can utilize a tax credit of this size. The acquiring company also gets the five-year accelerated depreciation on their purchase. All told, the federal subsidies pay for about two thirds of the project, and the state tax credits and incentives typically pick up about another 10%. So what do we get in return? Not much. For the state of Indiana alone, it would take tens of thousands of wind turbines to generate just 5-10 percent of the total energy used by Indiana consumers in a year. These things don’t produce a lot of energy, typically operating at just 15 to 25% efficiency. Wind turbines only generate their rated capacity in wind speeds of 30-55 mph. Below those numbers, power generation drops off rapidly; if the wind speed falls by half, power drops by a factor of eight. Above 55 mph, the turbines will actually “hit the brakes” and shut themselves off to prevent structural damage. This is an example of how the global warming hoax is used to line the pockets of politically favored groups. In the name of reducing carbon emissions to save us all from our impending doom, costly, inefficient means are being subsidized with taxpayer dollars, creating a few winners and, as usual, a lot of losers.